Kirk and his crew are at deadly risk from an alien creature that feeds on the salt in a human body and can take on any form. While exploring the edge of the galaxy, the Enterprise encounters an energy barrier that gives two crewmen godlike powers. A strange alien substance causes the crew to act out their deepest inhibitions, while the ship plummets out of orbit. A transporter malfunction causes Captain Kirk to split into his good and evil selves, and a landing party will freeze to death if they dont merge the two back together. The Enterprise picks up a intergalactic conman, Harry Mudd, and three incredibly beautiful women who harbor a dark secret. Nurse Christine Chapel is reunited with her old fiance on Exo III, but the scientist has plans for Captain Kirk and the Federation. Kirk and a landing party are stranded on a planet due to a disease that causes any adult to die a painful death, and must deal with the local children who have survived. Kirk investigates an experimental facility for holding prisoners and finds a sinister scheme. The Enterprise encounters a vast alien ship that sets out to test them. Spock kidnaps his former captain, the crippled Christopher Pike, and heads for a quarantined planet, putting his career and Kirks life on the line. Spocks court-martial continues as he attempts to justify his abduction of Pike, the theft of the Enterprise, and his heading for a planet declared forbidden by Starfleet. Kirk is one of the last survivors who can identify a mass killer, who lurks among a Shakespearean troupe aboard the Enterprise. Kirk pits the Enterprise against an invisible spaceship testing the Federations defenses. The Enterprise crew take shore leave on a peaceful, pastoral planet...where their dreams and fantasies come to life. Spock commands a stranded away team when their shuttlecraft is stranded on a planet with hostile natives. The Enterprise finds itself at the mercy of a seemingly omnipotent being who fancies himself a 18th century Englishman. When a mysterious alien race destroy an Earth colony, the Enterprise pursues but Kirk and the alien captain are forced to fight each other by powerful aliens. Captain Kirks career is at stake when he is put on trial for the loss of a crewman during an ion storm. The Enterprise encounters a seemingly peaceful civilization run by a benevolent being named Landru...who intends for them to join his people. The Enterprise picks up a crew of genetic supermen from the 20th century...and their leader, Khan, plans to create a new empire. The Enterprise arrives at a planet to establish diplomatic relations and finds itself in the middle of a peaceful war that threatens to destroy the ship. Kirk investigates a series of grisly murders on a mining planet that are the work of a seemingly hostile alien creature. Kirk and Spock encounter an alien named Lazarus who claims to be from an anti-matter universe. 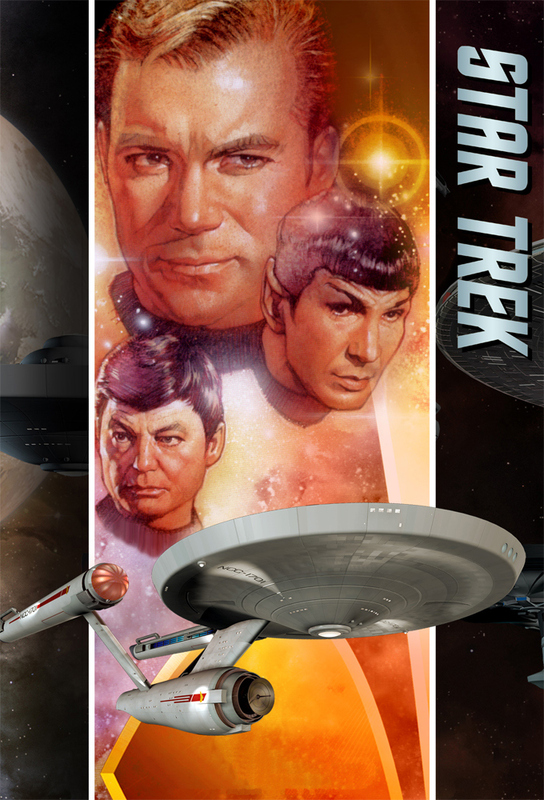 Kirk and Spock must travel into the past in order to correct a change that will alter history. Kirk and the Enterprise must combat parasitic aliens.